Retail $37.67 SAVE 28% ! A collection of good quality tools from different manufacturers that are need for building models. Gap-filling super-glue for general and detailed assembly. Extra-thick super-glue allows pieces to be assembled at any angle. Extender tips provided to allow for precise glue placement and control. Assortment of high quality natural hair paint brushes for supurb detailing. Soft grip anti-roll hobby knife for precise control. Assorted fine finish sandpaper for super smooth surfaces. Flexible masking tape to cover areas during spray painting, or to help define lines for detailed painting. Plastic clamp to hold pieces in place during assembly. Sandpaper Sheets (one each of #150, #280, #320, #400, #600). Soft-Grip Hobby Knife with Safety Cap. Natural Hair Brush Set (#0 Fine, #2 Medium-Small, #3 Medium-Large). 1/2 oz. Gap Filling Cyanoacrylate (super-glue). 1/2 oz. Extra Thick Cyanoacrylate (super-glue). 6 Extender Tips for Cyanoacrylate. 10 meter Roll of 10 mm. Masking Tape. This is a must have for beginners and season modeler. The kit has what is needed to work on any model. I highly recommend this product. 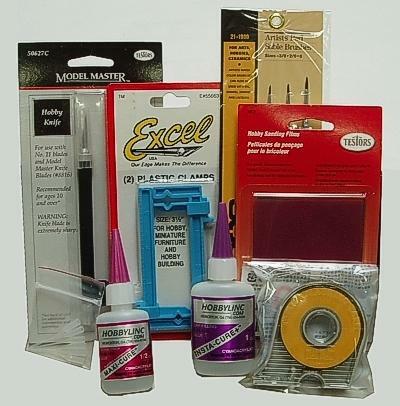 Nice starter kit with a well rounded tool selection for building detailing a kit.